Mom’s Priority has put together a list of 15 0f the best apps for moms, to help keep us all sane and organized through this busy season of motherhood! AnyList makes grocery list making and shopping simple and easy to share with other family members! Simply start typing the grocery item, and it fills in the rest, sorting the items by type. When you add the item to your cart, simply tap the item name and it will cross it out. The basic app is free, however, you can purchase a premium subscription and have more options. With premium, Any List can be used with major recipe sites like Allrecipes, saving the recipe and automatically adding the ingredients to your shopping list! This is a great app that is making my life easier! Errands is a task manager that reminds you of the commitments you make and helps keep you organized. I have used this app for several years now and it is super simple- just add a reminder like “call the vet”, set a due date (and time, if you need that), and a reminder will pop up on your screen, based on the settings you set. Streamlined, simple, but very valuable. If I’m in a conversation with someone and I say I’ll do something, it’s simple to add a reminder into this app. It’s important for me to keep my commitments, and with so many distractions, I can easily forget by the time I get back to my desk or a notepad. This app is so helpful for that!! Cozi is a popular app that helps families stay organized, with color-coded family calendar options, shared grocery lists updated in real-time, to-do lists like chores and packing lists, and even a family journal with the option to add photographs to keep memories organized! You can import Google Calendars into Cozi but not vice versa. The main goal that Cozi accomplishes brilliantly is coordinating busy family schedules so that every family member is on the same page! Mint is an amazing tool for keeping track of household spending and income, credit cards, and investments all in one place. Mint easily helps you categorize expenses and create a budget based on your spending. With all of this information at your fingertips, in the form of pie charts and graphs, you can easily see where you can afford to cut back and save, and you can even set up Mint to send you a note when you’ve overspent in a particular budget category. This app (and website) is completely free; it is supported through the ads which are often actually helpful and aligned towards you. My Fitness Pal is a fitness app, helping you track your diet and exercise through a simple interface. You start typing what you eat and it often prepopulates the item into the box. Based on what you enter, you can see how many calories you are taking in, and even the breakdown of food groups and nutrients! While using a iPhone 5S or 6, your steps will be automatically added into MyFitnessPal for a more complete picture of your health. Taking care of mom is so important, so you can take care of others! Shop Savvy is a neat app that helps you save money in the store by helping you comparison shop. Scan the barcode of the item you are looking to purchase and then Shop Savvy will search stores nearby for the best price on that item. It works best on items over $10, so not groceries. Artkive is a wonderful app for the parents of kids who have been in school or preschool a few years and have an abundance of artwork that they don’t want to just throw away, but simply do not have the space to keep it all! I personally put the artwork in my child’s birthday book for the year, but this is a smart way of managing all of the art in one place. This app costs $4.99 in the app store, but it does much of the work for you, putting them all together in a book or other keepsake! Chore Monster is an app that I am incredibly excited about trying! We have been using a manual method of keeping track of our kids’ good deeds and chores also, which has been incredibly successful. They earn “points” (on a white board) that build up over time (many months) to rewards, like a trip to D.C. and a new trampoline! They are very motivated by it, and especially strive to get points unexpectedly, like when we catch them in the act of doing something nice for someone else without being asked. This seems like the perfect app to keep it all organized. I can’t wait to try it out! Red Rover is a neat app for moms if you live in New York, Boston, the Hamptons/South Fork, Atlanta, or San Francisco. It provides you with updated kid-friendly cultural events, museums, and libraries that you can add right into your calendar and share with your other mom friends. 30/30 is a wonderful time management app for the moms and their kids who have trouble staying on task. It divides your tasks into time blocks so you are motivated and encouraged to complete tasks than your allotted time. It’s been an incredible productivity boost for me, and I can imagine it could be a game-changer for moms of kids with ADD or just any kids…taking the pressure/nagging off of mom and simply letting the app do the work. 7 Minute Workout Challenge is for the busy mom days when you still want to get a workout in. Simple exercises you can do anywhere, and your kids can do them too. I’ve used this app off and on for several years and it’s simple and it works to keep the fitness routine going. College Save lite is a free app that helps you plan for the future costs of the colleges your child(ren) are interested in. The upgraded version for $2.99 allows you to save your college savings settings and email out to others. This app seems very useful to parents or students who are looking into the affordability of college in the future. Team Snap makes it easier to coordinate the team with snack schedule, game location changes, schedules, and availability. Rain always seems to always be an issue for spring ball, so getting notices as soon as possible, as simply as possible, for schedule changes is a lifesaver. You can select the option for your calendar to be synced so your calendar is automatically updated and you are managing time wisely. Volunteer Spot is the perfect app for any potluck, classroom volunteer signup, ministry meal, party, etc. The app costs $1.99 but you can use the Signup Genius website online (similar) for free. Both are fantastic and necessary tools to keeping everything organized without overwhelming anyone with a ton of email replies! Ringya is a good app for setting up communication among a team, with voice, text, and email communication and group chat that everyone can receive even if they do not have the app. Ringya helps keep everyone in the loop for work teams, class list parents, sports clubs, and community groups. 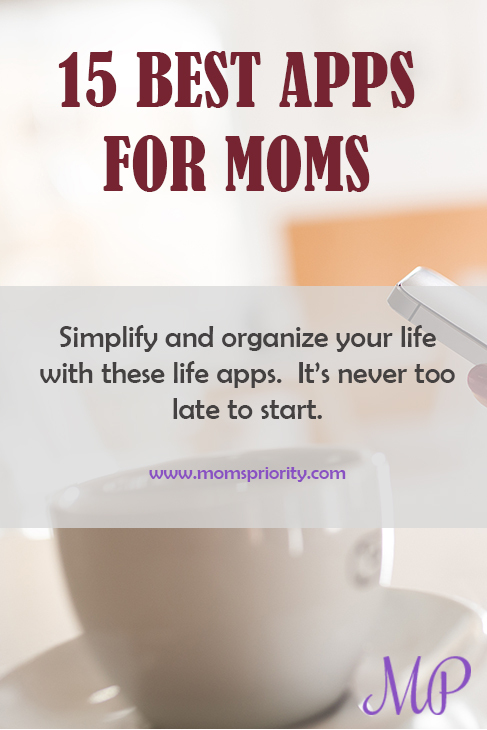 Here are just 15 amazing apps, perfect for busy moms who want to stay organized! These days with children are so precious and fleeting, and we want to make the most out of our time and resources. 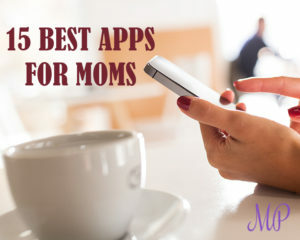 What are your favorite mom apps? Email us at momspriority@gmail.com or comment on our Facebook page. We’d love to hear from you!